Here are some comments from Allison. If you go to Alpine Meadows please be sure and say hello to Allison and Clancy! Ski safe! 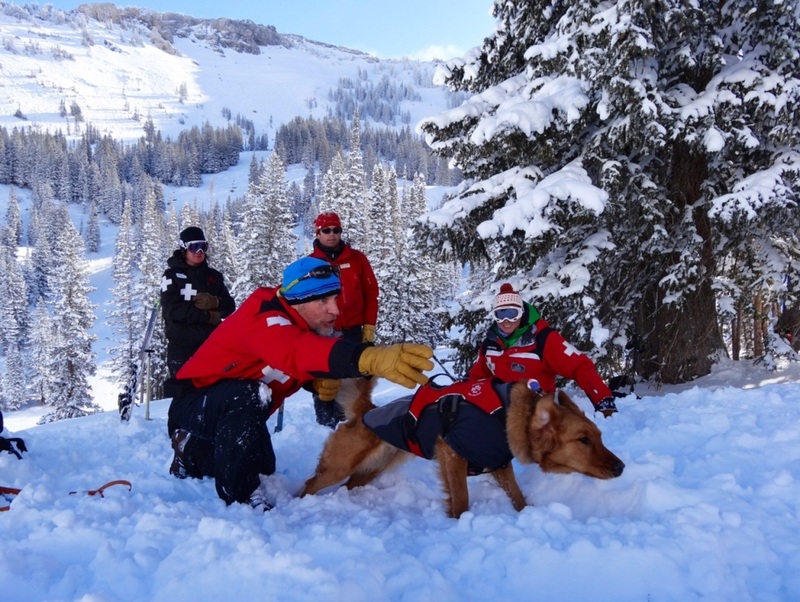 We just finished CARDA (Canadian Avalanche Rescue Dog Association) dog school the last week of March and Clancy did great! He is officially an avalanche dog "In Training" based on the CARDA standards and next season if we keep up the good work we should validate and he will be a certified avalanche rescue dog. We learned so much and he excelled rapidly throughout the week. He is pretty amazing to watch. At the beginning of the week we had mainly focused on live burials and a few article finds, mainly buried very close to the surface. By the end of the week, he was finding 2 articles in the same exercise and we had increased the depth of the burial significantly. To be honest, I think I learned more than Clancy did. I really started to pick up on his alerts of when he had a scent - he has a great head snap that I have now noticed and his tail also goes straight out when he first picks up a scent. The CARDA program wants dogs with high prey drive and good ranging, both of which the CARDA trainer commented Clancy has. He ripped through a couple of articles because he was tugging so hard to get it out of the snow and that is what they like to see. He also has no problem ranging away from me and searching....once he is on a scent he doesn't give it up. As wonderful as he did, he still has his puppy moments and in one exercise once he got the article he was so proud of it he pranced all over the site for a good ten minutes playing keep away (good thing he's so cute). The CARDA program also really focuses on picking the right puppy and I got a thumbs up for picking the right puppy. I let them know it was an extremely tough pick from a litter where majority of the pups had the traits to look for. I can't thank you enough for blessing me with the opportunity to raise/work with one of your amazing puppies. With a passion for hunting and dogs, Kym of Lish Kennels in Idaho, called looking for a new addition to her accomplished line of hunting goldens . 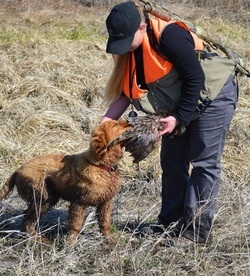 Kym will tell you that "There is nothing better than to hunt behind a well-bred dog." Lish Kennels prides itself on producing the finest hunting dogs and best family companions. Included on their usage list is both upland game birds and waterfowl. 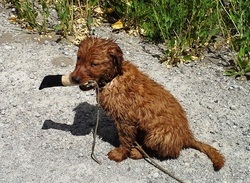 Rusty is showing exceptional interest in both hunting and retrieving. Kym shared this photo of 4 month old Rusty after a Spring training trip to the bird ranch 2014. "Rusty has been progressing well. He is a pleasure to train and work. He possess drive and a can do attitude." We were delighted to meet Bill during his puppy selection process. Methodical in his approach, Jedediah will most likely be his last partner as Bill will soon retire and enjoy the outdoors with Jed. Bill is a true golden lover, enthusiast and terrific owner. "Jed is doing well. Growing so fast I think at night during the quiet hours I can actually hear him growing. Crate trained and mostly housebroken we are going on long walks through our mountains and he LOVES it. Interestingly enough, he will come to me like a banshee outa hell from long distances and jump into my arms at full speed." Bill is working with Jed about 10-15 minutes per day on COME, STAY, SIT and HEAL. Adding fun to his early training while escaping the summer heat, Jed also enjoys some fun bumper water retrieves as seen in the video below. These fun, less disciplined exercises set an early foundation for more serious work later on and creates the working bonds between dog and owner. At only 3.5 months old, I'm very impressed at Jed's interest and drive. Libby is a gorgeous golden. Leanne and her husband drove all the way from Chicago to pick up her puppy (New travel record!) They had first pick. It was a pleasure meeting and talking with them about their new puppy, Libby. Leanne spent a lot of time studying and thinking about the right puppy at the right time. It was a pretty quick turn around as they headed back the same day. We expect a bright future from Libby. Libby is growing quickly and loves her new family. "Hi Jed! Libby is wonderful! We just love her!! She is just an awesome puppy - we couldn't be happier...and she's potty trained already too...very smart! Every time we go to the vet all the techs and pet owners want to pet her because she is so cute and sweet. Libby still likes to be held and will cuddle up with us at night on the sofa. She is ready to go hunting too - she often stands at attention when she sees a bird." Tara and her family are anxious to get Murphy going in competitive agility. Their daughter Kate, has been following us on Facebook for some time. Kate found our website and assured her mother that we had the right puppy for them. They've been waiting about a year for this new guy. I met Kate and her family on a cold Cache Valley Saturday morning 2014. Murphy is bound for Southern Nevada and may never see the snow again. I don't think he minds at all since the average temperature during his first 8 weeks was in the teens. Kate has done her home work and flat out knows goldens like no other 13 year old I've ever met. I was thrilled to see Murphy go to usage home where he would be used, loved and trained. Kate and Murphy have started their agility training at a local facility. Murphy is about 3 months old in the video below. Agility is a competitive sport for all types of dogs. As you can see, its an obstacle course made up of jumps, tunnels, and walkways. Dogs and handlers work as teams, with the handler helping the dog to navigate the obstacles in the correct order. Some people do agility training just for fun, while others enjoy competing in agility trials. During the trials, dog and handler teams compete to see who can complete the obstacle course the fastest with the fewest mistakes. In order to acquire the title, a dog must achieve a minimum of 750 championship points and 20 double qualifying scores obtained from the Master Standard Agility class and the Master Jumpers With Weaves class. The winner of the annual National Agility Championship shall be entitled to be designated National Agility Champion of _____(year). Pictured is the female we bought from you two years ago, Jilly, with my 11 year old yellow lab, Jack. Jilly is out of Bridger X Sheila. 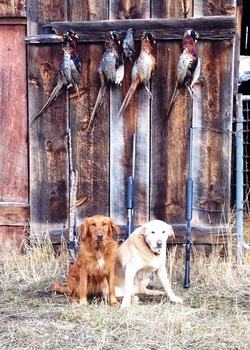 She retrieved all of the birds in the photo and the day before retrieve 10 of 11 quail. The old fella in the picture wasn't her only competition on retrieves, she was up against a couple of 100 lb chocolate tanks that belong to my childhood friend. I must say that she is like my last golden in the fact that if given the opportunity she will strut around, head held high, with birds in mouth quite proud of herself. Jilly is coming on well hunting, after a long hunt all other dogs are laying around yet she manages to still be bouncing off the walls. Attached are some Lily pics. Not print quality, but they do show her spirit and stunning looks. She is an amazing animal, we LOVE, LOVE her, and our family is VERY, VERY happy that she’s in our lives. Lily LOVES the snow and can't get enough of the big pine cones we have here in Tahoe. Yesterday when she couldn't find the stick or pine cone I'd thrown, she was instinctively doing the back and forth/side to side sweep in order to cover the possible territory. She's not yet cued in to my pointing, but I think she's about to get that too. She's smart as a whip. She learns very quickly. You breed beautiful puppies, Jed (and Carson). Thank you again. We had a great Saturday morning meeting Rachel and Jake. Two of the three families choosing males were at the house at the same time. I'm always amazed at how the pup kind of chooses the owner. I think this was the case as the boys found the right families for them. We teased each other about rival universities and an upcoming fall football game. Their team color is red so Riggs fits right in. Bummer, they don't make navy blue dogs. Its all good! We are very happy about the care and time the owners are talking with this wonderful breed. I hope to see Riggy at the lake. I hope you and your family are well. I wanted to send you some video and pictures of Riggs-(Dark Golden, picture bottom left.) we are absolutely loving him. He is definitely part of the family. He loves kids, playing with other dogs, and will crawl right up on your lap to say hi. He is learning commands well, and is totally potty trained. We couldn't be happier with him. We took him up to Bear Lake this weekend and introduced him to the beach and the water- he loved it! He got right in and even swam in deeper water- what a champ. Can't thank you enough! Lyn and Jerry, retired with time and a passion for goldens, came looking for a nice hunting, field, walking and family companion. We visited and talked about usage and wants. They spent a lot of time in the back yard observing and discussing. They settled on Bridger Jr. Looks like he’s doing great. Josh & Scout had a great 2010 Opening Day Duck hunt in Utah County 2010. Scout is a great hunting, family dog and beloved friend. Josh has been a fantastic owner/trainer and a good example of diving in and learning the HT system. I’ve seen Josh and Scout together and they are true buddies. It’s amazing what a good dog can do to a person. Ann & Grant contacted me from NM where they raise and train horses on a beautiful ranch. They were looking for an all-purpose Golden that would fit into their active lifestyle. The Push X Sheila litter caught their eye and we are very happy it did. It looks like Heidi has a wonderful family in a beautiful part or the country. “Heidi is all grown up now. She is undoubtedly the most athletic dog we have ever had. We love her temperament. Just a sweetheart! She is very eager to learn…. I have attached a couple of pictures that capture her spirit and her beauty. I never saw a dog love the snow as much as she did the day we took these photos. It must have reminded her of Utah. She’s a strong dog and has some serious running speed. She’s a great dog and really has turned out to be good at being helping with chores and taking care of our other dogs.” We could not have done any better. Best Regards from a very happy parent, Marta. Once in a while something happens in life that brings a person back to earth. 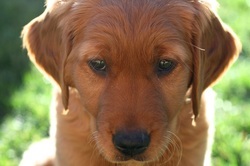 In the race to raise and train great multi-purpose goldens sometimes the human touch gets lost in all of it. This was case between a very special girl and her very special golden retriever. Several months ago Marta called me from Washington State. She told me that her 13 year old daughter had found my website and really, really wanted a puppy from the Opie litter. She’d looked at several sites but told her mother that there was a female in that litter especially for her. At first, I smiled and figured it was the sweet dream of a 13 year old girl. Miquela (Mekayla) insisted, had been saving for some time and sent in a deposit. She told me her name would be Kola. A Native American name that means friend. Miquela and her father drove to Utah from Washington when Kola turned 8 weeks old to pick her up. Here’s the rest of the story. Meanwhile, I was unaware that my 9 year old daughter Clarissa had fallen in love with Kola. She played with her every day. Because of the demeanor of Kola I decided she’d be the right one for Miquela. Clarissa happened to be there when Miquela, her father and brother arrived. I asked Clarissa to go get the puppy we’d chosen for Miquela. When she handed Kola over to Miquela, Clarissa ran inside. After they left, I came inside to see where Clarissa had run off to. My wife motioned to her room and explained what had been going on the last several weeks. I tried to explain to saddest 9 year old in town that we have a nice dog and that Miquela needed a nice dog too. As a father, this was one of those tough ones. Recently, Marta sent me and e-mail and a picture. It’s extremely heart-warming and worth sharing. Josh and Lisa stopped by to pick out a replacement hearing impaired -therapy dog. Unfortunately, they lost their lab in an accident. It was a bitter/sweet evening as they discussed what happened. I quickly learned about the time and effort it takes to train a hearing impaired dog. They decided to spend the next several years with one of Sheila’s daughters. Good Choice! They needed an intelligent, strong natured dog that was willing to serve them for years to come. We are very excited for them. Here’s what they have to say about Akhila the oldest daughter and first born of the Opie litter. I wanted to send a cute picture from Akhila’s birthday this year. It was fun since she is pretty good about letting us put things on her now that she is training with the service dog vest. We also took Akhila on her first plane ride to Seattle to visit Josh’s family at the end of June. She sat in the front seats of the plane with us and laid at our feet. She did extremely well throughout the whole airport / shuttle / rental car process with the large crowds and distractions aplenty! Her ears perked when we took off the first time but the way home it was like she was an old pro. She is getting more mature and loves to learn new things and is great at all the clicker training we do with her. We tire her out with a lot of walks and Frisbee throwing too! She has also been swimming so much now that she swims the whole time and doesn’t ever want to get out! Utah Lake has a great place that is quiet and calm for dogs and people to swim and we’ve been there a couple times. We plan to keep working on service dog things for the next year and then start putting her through the therapy dog training. She has a very gentle and perfect personality for also being a therapy dog. George and Shirley of ID, a retired couple, with a zest for life and love of golden retrievers made the drive from Northern ID to meet Sheila and pick out their puppy, Sunny. A beautiful female with a medium golden coat. We had a wonderful visit and found out how much they really love their dogs! Here’s what they had to say after picking their puppy. We took the opportunity to visit with Andy & Shawna during our visit to Jackson Hole WY fall 10’. Sweep is now 3 years old and we were very impressed with his training and athleticism. Sweep is flat out fast! He was tireless as Andy let had him retrieve at the local fair grounds. I was told Shawna does a lot of the training for 4H agility. He’s been well trained and taken care of as he gets treated like their own kid. Another example of fantastic owners and they told me they wouldn’t trade him for anything. We had a great time swapping stories and watching Sweep. Thank you for letting us enjoy your dog for a while. Andy & Shawna of ID attended a dog show in a nearby city during the spring 07’. They saw conformation, agility, obedience and rally competitions. They wanted to match the right breed to their situation. I was most impressed by how much homework they did. I’m even more impressed with how they are helping sweep develop. 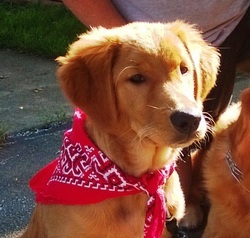 They came away convinced that a field bred golden was the right thing for them. In addition to being a family dog, Andy hunts as seen below with Sweeps first duck hunt. Also shown below are Sweep and Wendy working together at a 4H agility competition. 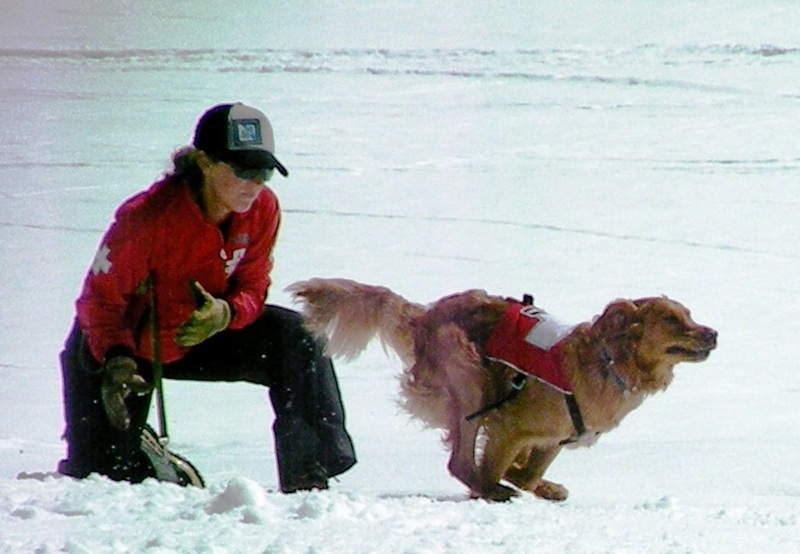 Wendy trains with Sweep at a club for agility. Wendy recently posed with Sweep holding a blue and red ribbon after winning her competition. Congratulations!! Tom invited our family to Jackson Hole WY for a weekend this fall 10’. We got a chance to see 2 year old Looper for the first time. Tom has already used him in the Dakato’s upland hunting and wow did we get a treat! Looper is a smooth, good looking boy that gets right serious about his work. He loves to hunt and his bedside manner is wonderful. He’s 70lbs of lean muscle & go juice! Tom told me this is flat out the best dog he’s ever owned. They are great buds as Looper simply wants to please. Thank you Tom for having us up for a visit and good luck with this wonderful golden! Stacy contacted me about replacing and old friend and a fun new project for a young family. He joins a couple other play mates on a farm in Montana. Rio will hunt upland birds and keep the boys busy! “Here is Rio! He's very happy. He loves the water. We have had a lot of rain this spring hence; we have a lot of puddles. Rio will stick his nose down in the water and blow bubbles. It’s the craziest thing. We love him very much. Hope you and your family are doing well."